Poison ivy is a vine that is identified by leaves that are composed of three pointy leaflets that are about 3 to 4 inches long. These leaflets can be smooth, toothed or lobed. Poison sumac looks like a shrub or small tree and has seven to 14 smooth, oval leaves that are grouped along the same stem. 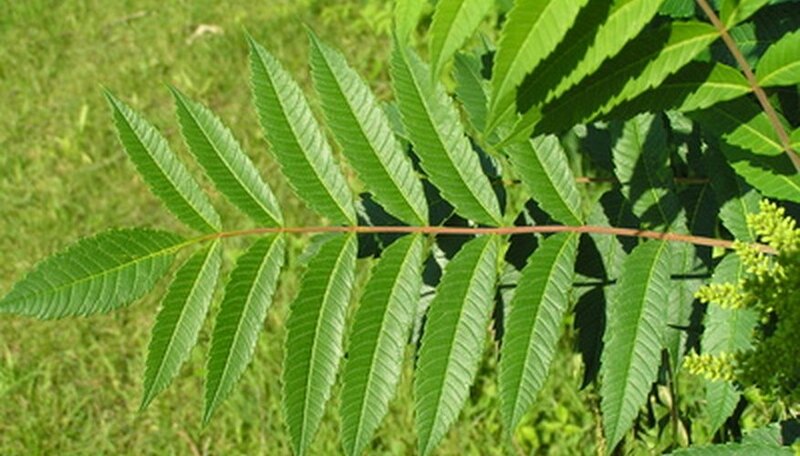 If you have poison ivy or poison sumac in your yard or garden, or even in the woods where you and others often go, you should get rid of it as soon as possible. Wait until a calm day to get rid of your poison ivy or poison sumac. Wear long sleeves, long pants tucked under your socks, gloves and goggles. If you are allergic or have had severe reactions in the past to poison ivy or poison sumac, consider having someone else do this job for you. Dig and pull up the poison ivy or poison sumac up. Get close to the ground and try to get up as much of the roots as you can. This is easiest done when the soil is slightly wet. Cut the poison ivy or poison sumac down to the ground as an alternative to pulling it up. Use hand clippers, a weed whacker or a mower for this step. You can keep doing this until it stops growing. Eventually most of the roots will die from starvation since the plant is unable to absorb sunlight for energy. Spray an herbicide that contains either the active ingredient glyphosate or triclopyr on the leaves. Do this as an alternative to the other methods of control or use to spray random shoots as they grow. Read the manufacturer directions for proper application methods when using any herbicide. Discard the pulled or dead poison ivy or poison sumac in plastic bags to be disposed of at your local dump. Do not compost. Most important, do not burn poison ivy or poison sumac. The smoke can also cause a rash and reaction, including in the eyes, nose and mouth. Take off your clothes and shoes carefully and wash them in hot water with your regular laundry detergent. Rinse out your washing machine when finished. In addition, thoroughly wash off with water all tools that were exposed to the poison ivy or sumac.